Remember us and think what might have been. Eastbury War Memorial – Dedication Service, 2 Oct 1921. 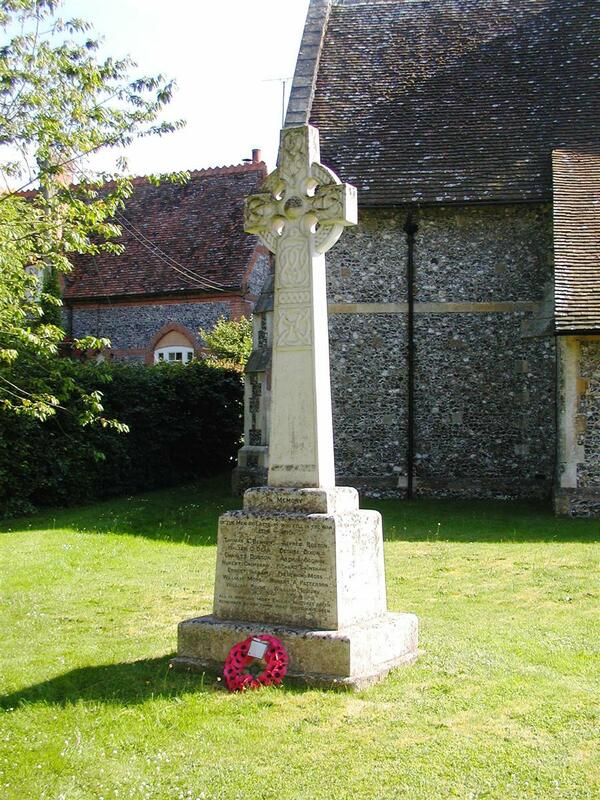 "In memory of the Men of Eastbury who fell in the War, 1914-1919." Brethren pray for us. RIP." This is the inscription which together with the names of the fourteen fallen heroes, who died in the service of their country, appears on the Memorial Cross erected at Eastbury as a tribute to those whose memory it is set up to perpetuate. It is a simple monument consisting of a Celtic or runic cross of Portland stone mounted on a square died, with a base or plinth of the same material, but it represents all that is highest and noblest and best in human attainment, the sacrifice of precious lives for the benefit of others. The memorial, twelve feet six inches in height, stands in a commanding position on the enclosed piece of ground in front of the parish church surrounded by trees, yet where all can see it. The unveiling and dedication took place on Sunday, when there assembled a large number of parishioners from Eastbury, East Garston and Lambourn, to witness the ceremony. The first portion of the service was held in the church, the Vicar and the Rev H H Didcock, Primitive Methodist Minister, of Hungerford, taking part. The hymns sung were "The King of love my Shepherd is," and "I heard the voice of Jesus say," and the lesson taken from the Book of Wisdom III, 1-9. Special prayers from the liturgy of S Chrysostom were used. The church was crowded to its utmost extent, several persons having to remain standing. After the names of the Fallen had been pronounced, there was a two minutes' silence. A procession was then formed, headed by the Churchwardens, Messrs W L Spackman and C R Parker, the school-children, the returned soldiers, parents and relatives of those commemorated, Lieut-Col Collis, CMG, DSO, the Vicar of Eastbury, Rev C H Mandell Jones, Rev H R Didcock, and the congregation. This made its way to the memorial, which was draped with a flag. The Vicar then requested, Lieut-Colonel Collis to unveil the memorial. Colonel Collis, who was attired in khaki, wearing two rows of ribbons upon his breast, and a black armlet on his sleeve, gained his honours in the late war, serving in Egypt with the 6th Dragoon Guards, and also the South African Campaign. After releasing the flag exposing the memorial to view, he referred to the call to arms in 1914, and the spontaneous and ready response which followed until the comparatively small army of 150,000 eventually grew to six million men serving in the field. Their casualties were, alas, nearly a million. It was marvellous how the men adapted themselves to active service. Men in France had the advantage of going on leave to England, but in Egypt and farther East, they were not so fortunate in that respect, and although the fighting in France was fiercer, the hardships in other parts were more severe. Many of those who went out sacrificed their lives, and it was up to those who remained to shew their gratitude and appreciation by trying to establish and to keep the United Kingdom and its Colonies the greatest Empire in the world. They must all pull together, try to do away with industrial strikes, and by so doing they would honour and respect those whom they could never honour too much - the Fallen men. The Rev C H Mandell Jones then dedicated the memorial, after which a large wreath of laurels and chrysanthemums, subscribed for by the parishioners, was laid at the foot by to little girls. Ada Dobson, aged six, an orphan whose father was killed in the war, and Hilda Benson, aged seven, who lost several relatives. Responses and prayers were recited, after which the hymns, "When I survey the wondrous Cross," and "O God our help in ages past," were feelingly sung. the ceremony being brought to a close by the Vicar pronouncing the Blessing and the singing of the first verse of the National Anthem. These fourteen represent more than a quarter of the total number of men from the parish who served in the war, and whose names are recorded on the Roll of Honour placed in the church. The memorial was designed and sculptured by Messrs Thorn and Sons, of Newbury.